Brewers Decorator Centre in London Victoria is the only Brewers branch to display the Royal Warrant above the door for excellent service to the Royal households. We specialise in Grosvenor Estate specifications and bespoke colour matching. Of course you’ll also find a large wallpaper pattern selection, trade and designer brands of paint and decorating sundries and tools to carry out decorating jobs at a home or corporate level. Our team shares more than half a century of Brewers experience and expertise – all of which is at your disposal, including via Twitter at the dedicated Victoria branch Twitter account (www.twitter.com/BrewersVictoria). Our showroom can be found on the one-way Eccleston Street, a few minutes’ walk from Victoria station via Buckingham Palace Road. 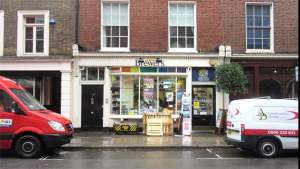 Head north-east on Eccleston Place, turn left onto A3213 and the store is located on the left. Head south-west on Eccleston Place, turn right onto A3213 and the store will be on the left.